Thursday, November 15, 2018: Wanna better bass? Grab your rain gear --- the best gear you got. It’s as pissy and chilly as it gets in November, but the causative onshore winds might be enough to blow in Classic-grade stripers. However, this is once again a wham-bam weather blast, spinning through so quickly there are tornado/waterspout fears just to our south. There is a scattering of trucked-in surfcasters seeking those storm stripers. I’m not going to be among them even though I swore up and down that I would rough it this fall. Meetings are my built-in excuse for today, though I could get in a couple in-between sessions – as I look out the window at even worsening conditions (1 p.m.). Look for a rapid sky cleanup tomorrow. This does leave a chance to take a turn-over bass or two, hanging out for a short time after the blow. Tomorrow's sun is more my cup of Holgate tea – not that Holgate is any longer the striper mecca it was not that many years back. In fact, the area most devastated by the Island’s recent-years dearth of bass is the far south end, where caravans of buggies would once halt to take in the Rip’s striper offerings. We'd even jockey for better positions near the Rip. Now, it's me and a couple lingering black-back gull vying for beach space. BASS POACHERS RUNNING RAMPANT: I just got the latest reports from NJ Division of Fish and Wildlife’s Bureau of Law Enforcement. It shows monthly police report highlights from between September 21, 2018- October 20, 2018. In early September, Detective Moscatiello and CPO Woerner, acting on a tip, conducted an overnight patrol along the Manasquan River. They had been alerted to ongoing night-fishing activities of three men who would routinely fish atop a famed railroad trestle over the river. They quickly got quite the investigative eyeful, as the men could be seen harvesting striped bass, left and right. Hmmm. I believe that’s a tad illegal – for folks of any ethnic background. The officers watched long and hard – then moved in. The third fisherman was then nabbed on the tracks. He had 15 undersized striped bass. That brought the total bust tally to 46 undersized striped bass. 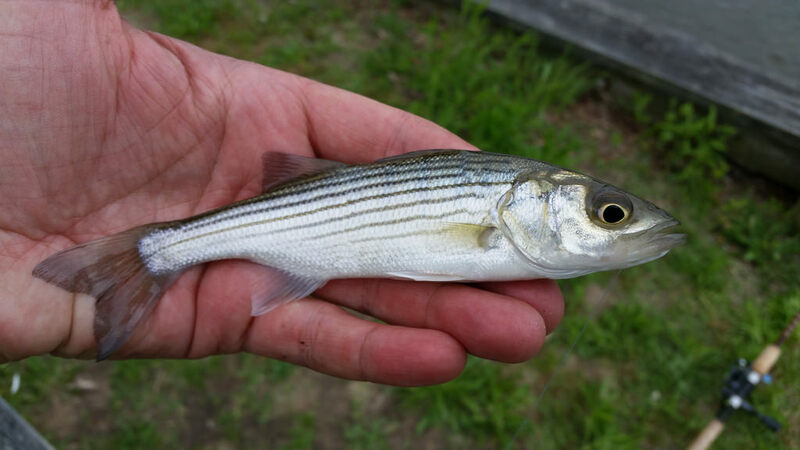 They were issued court-mandatory summonses for possession of undersized and over-limit striped bass. Now, to a reality-math sandwich. What’s the odds this was the first and only night of poaching for these three? How many bass had these men likely taken on previous nights – maybe previous months, even years? But the reports have only begun. Oh, but there’s more poaching busts. A biggy took place in Downe Township, Cumberland County, where female CPO Shepherd surveilled a fisherman at a site famed for smaller striped bass. “She observed the individual catch and retain three undersized striped bass before she conducted an inspection. The fisherman was found to be in possession of 10 undersized striped bass, one undersized black drum, and three undersized black sea bass.” His excuse? The fishermen told the officer he thought they were all perch. That bust got weirder and worse. “While walking back to her patrol vehicle to issue summonses, CPO Shepherd heard repeated scratching coming from the bed of the fisherman's truck. Upon inspection of the buckets in the bed of the truck, she found an additional undersized striped bass and a live diamondback terrapin.” I wonder if he thought the terrapin was also a perch, you know, one with legs. Summonses were issued … as if. Another notable bust came about when Detective Harp observed an “elderly female” – walker resting nearby -- fishing from the boardwalk. “As she caught undersize tautog, she wrapped them in plastic bags and placed them in a compartment under the seat of the walking aid … “Upon inspection, she denied catching any fish, and offered her bucket for inspection before Detective Harp asked her to remove the fish from her walker.” Any bets this wasn’t a little old Jewish grandmother? Again, these are just a portion of the reports I’ve been reading. For a direct read, go to https://www.state.nj.us/dep/fgw/cnclminutes.htm. The site shows how active the division is. Very impressive. You can sign up to be sent regular reports. This month-or-so of busts offer only the slightest insights into the wide-ranging and surely rampant theft of our fishery resources. Whenever I read these reports, I have to give immense credit to the understaffed FGW officers who cover huge areas. Now, I’m going a bit rogue by openly suggesting I think I know the ethnicity of many a flagrant poacher. I’ve written on it in the past. I’ll further venture a guess that those illegal fish were essentially sold before they were even caught. It’s part of what amounts to an illegal loosely-organized catch-and-sell ring. I’ve been told both on and off the record that the profit margin for many of these poachers -- when selling illegal striped bass and highly-prized (among Asians) tog – is so great that any fines are laughably insignificant. The punishments serve as no deterrent whatsoever, especially when many a non-fishing judge goes soft when the innocent-eyed accused say, “We just didn’t know, your honorable honor sir.” OK, so maybe there are some nasty fines leveled on violators but, as noted, they are minuscule in a big-picture fish-theft vein. As many folks know, the BL South Jetty has been a known poaching site in the past, though I believe the high public presence there, along with a closing of the parking lot after dark (at the state park), has held it to a minimum. Also, Island anglers are hawkeyed when it come to noticing the keeping of undersized fish. I should know since I’m often the one who fields the calls, though I’m now more confident when passing on the NJ Fish, Game, Wildlife call-in numbers, though I am confused by the advisory at www.state.nj.us/dep/fgw/ogt.htm: “NJ OPERATION GAME THIEF (NJ-OGT) HOTLINE should only be used to report hunting violations.” One of the reports notes “the complaint came in through the Division’s “Operation Game Thief” hotline. I’m guessing it also works for fish poaching. Abuses elsewhere: Just a few of dozens of recent undersized bass busts in other states. It hints that the poaching can have a big impact. Even in Callie: I like the "trafficking" terminology. Over the last year, wildlife officers checked the two men on several occasions as they were fishing throughout California’s Central Valley. Both men were frequently found to be in violation of various laws, including possession of gross overlimits and retention of undersize striped bass. 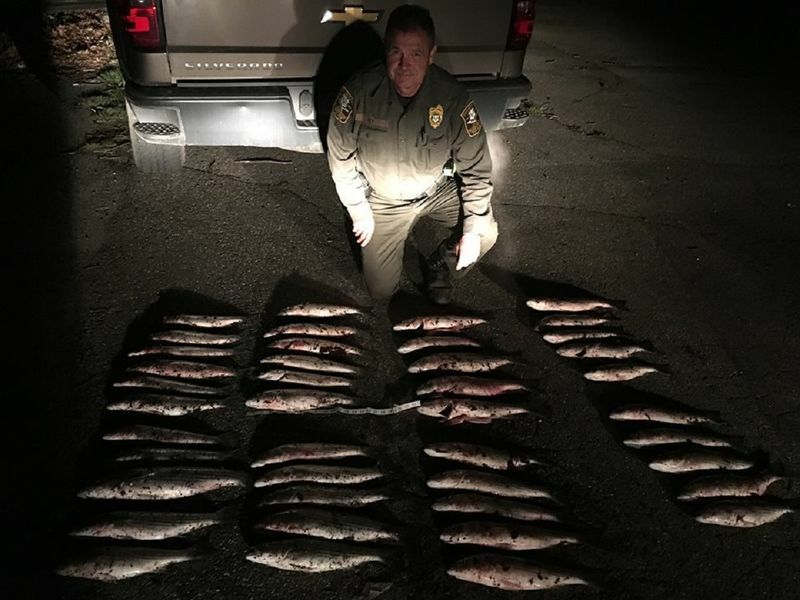 The two men were cited a total of eight times in the last year, and the egregious nature of their poaching activities led wildlife officers to believe they may be selling fish on the black market. 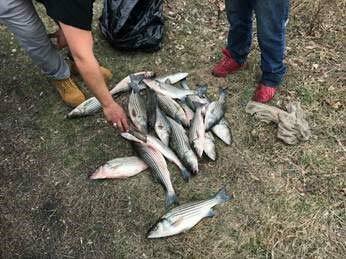 Wildlife officers analyzed the suspects’ citation history and began a focused investigation collecting an abundance of evidence showing that they had made thousands of dollars through the illegal sale of wild-caught striped bass. The investigation culminated in multiple search warrants served Thursday morning where wildlife officers located live crappie and bluegill in an aquarium, frozen striped bass, marijuana and evidence of a marijuana cultivation and sales operation, and methamphetamine and evidence of methamphetamine sales. Striped bass were introduced to California more than a century ago and quickly became a highly prized game fish throughout California’s Central Valley. Known for its white flaky meat, striped bass are commonly targeted for consumption. Sport fishing activities related to striped bass generate millions of dollars annually to the California economy; however, commercial take of wild caught striped bass was outlawed more than 70 years ago. The continuing demand for wild-caught striped bass gives way to an illegal black market which threatens local bass populations and the legal sport fishery. Anyone with information about unlawful fishing, hunting or pollution is encouraged to contact CDFW CalTIP, a confidential secret witness program that encourages the public to provide wildlife officers with factual information leading to the arrest of poachers and polluters. The CalTIP number, (888) 334-2258, is printed on the back of every hunting and fishing license. Tips can also be relayed by text to tip411, which allows the public to text message an anonymous tip to wildlife officers and lets the officers respond back creating an anonymous two-way conversation. Anyone with a cell phone may send an anonymous tip to CDFW by texting “CALTIP”, followed by a space and the message, to 847411(tip411). There is also an app for smartphones that works similarly. For more information on the program and the new CalTIP app, please visit www.wildlife.ca.gov/enforcement/caltip. Copyright © 2018 The Washington Post Co.
For several years, biotech companies have been promising "clean" meat, "cell-based" meat, "cultured" meat — whatever you want to call it — as a way to enjoy the taste of chicken, pork and beef without the brutality of animal slaughter or the environmental damage of big agriculture. But what about fish? What about something as prized as buttery bluefin tuna, a delicacy that has become the forbidden fruit of the sea because of the many threats that have landed the fish on threatened and endangered species lists? Unlike scientists who grow chicken or cow cells in a lab, Wyrwas can't exactly biopsy a living animal for tissue, given that bluefin tuna travel the world's oceans at speeds approaching 40 miles per hour. Nor can he grab a sample from one of the precious few bluefin tuna farms, which would view him as competition. Nor can he walk into a fish processing plant and request a sample. Bluefin tuna die on ship, many miles from shore, their cells slowly decomposing even when frozen or on ice. No, to get an uncontaminated sample, Wyrwas has to head out to sea. Wyrwas, 26, and his Finless co-founder, Mike Selden, 27, don't like to talk specifics when it comes to sourcing bluefin tuna samples. In the competitive, tight-lipped market of cellular agriculture, no company likes to volunteer information that it earned the hard way: through scientific trial and error or, in Wyrwas's case, through countless hours sitting on boats, fighting the elements and his sterile equipment to secure a quality sample that could, hopefully, provide healthy stem cells. Even once he succeeded, Wyrwas and the Finless team had to learn how to culture, or grow, bluefin tuna cells without the actual animal. Without the fish's natural habitat. And without the fish's standard diet of squid, mackerel, herring and more. The scientists had few blueprints to follow. "The cell culture would often die because we were sort of shooting in the dark in the beginning," says Selden, sitting in a conference room at Finless's offices in Emeryville, Calif. "We didn't know how to culture bluefin tuna cells because basically nobody knows how to culture bluefin tuna cells." What's more, marine ecosystems could begin to restore the harmony that's disturbed when a top-level predator is removed in such large numbers. To cite just one example, scientists predict that jellyfish populations could explode without an apex predator, affecting both tourism and fishing operations. Plus, without the need for commercial fishing boats to chase after tuna, the oceans could see a drop in the pollution from these vessels, whether discarded plastics or dumped fishing gear. In 2013, when Dutch researcher Mark Post debuted what would become the world's most famous lab-grown meat — a five-ounce beef patty mixed with bread crumbs — the response from tasters was tepid. Which was not surprising. The beef was grown without any fat. Regardless, the tasting was designed more as a public-relations stunt to drum up interest in an emerging field that promised to give diners their meat with fewer of the harmful side effects — such as greenhouse gases, animal waste, reckless use of freshwater resources and animal suffering — of big ag. Post and his colleagues "left the media with the impression that you grew a burger in something that looked like a petri dish," says Wurgaft, author of "Meat Planet: Artificial Flesh and the Futures of Food," set for release next year. "It's like imagining that rice grew in a bento box." In reality, the scientists grew thin sheets of bovine muscle cells — thousands of sheets, each no wider than a strand of hair — which they essentially fused together with a kind of meat glue. The process is "obviously not scalable," Wurgaft says. In a whitewashed room that smells like bleach, Jennifer Tung, a senior cell biologist for Finless Foods, actually does rely on something that looks like a petri dish. It's called a cell-culture flask, and Tung uses a lot of them to keep bluefin tuna stem cells alive. It's a standard part of the R&D process. Each flask contains a thin layer of grapefruit-colored liquid — it's the food, or "media" as its known in the trade — that allows the cells to grow. The only way to see the cells is under a microscope. One vital step in culturing meat is to create an "immortalized" cell line, which theoretically can grow forever, meaning you never again need to go out to sea to capture fresh samples. "We think our bluefin tuna line is immortalized," Selden says. "We're pretty sure." As important as that development is, however, "it is not the same as being able to make meat," Wurgaft cautions. In fact, growing stem cells into something that precisely mimics the fatty flesh of bluefin tuna is not considered possible yet. The technology for such a textured product is still years away from a commercial application, say Selden and others. At present, biotech firms can grow cells in devices called bioreactors, but the resulting meat is more paste than flesh. Which is why Just, the San Francisco company behind a plant-based version of mayonnaise, plans to first release cultured meat products that don't rely on firm, fleshy textures. Before the end of the year, Just expects to introduce a chicken product to some still-unnamed restaurants in Asia. It won't be a cultured chicken breast or thigh, but something closer to the consistency of a nugget, with fried-chicken skin and with plant-based materials serving as binder and flavoring agents. "If you buy Tyson chicken nuggets, some percentage of the nugget is plant-based," says Josh Tetrick, co-founder and chief executive of Just, formerly known as Hampton Creek, a company with almost as many controversies as successes. "A chicken bite is much easier than bluefin tuna." Then there's taste. The flavor of the chicken you now eat occurs naturally, in part, from the animal's diet. Tetrick and his team at Just say they have found a way to incorporate plant-based material into the food media so that when chicken cells are cultured into paste, they end up tasting like the real thing. In an experimental kitchen at Just's headquarters in the Mission District, Chris Jones gets to play around with the plant-based materials and cultured meats that others in the company discover or create. A former chef de cuisine at Moto, the once-celebrated and now-closed restaurant in Chicago, Jones is vice president of product development for Just. Recently, he's been dehydrating cultured chicken paste so that it resembles skin, presumably for those nuggets. "I actually think it tastes cleaner, and better, than real chicken skin," Jones says. He hands me a golden sliver of the lab-based skin. It crackles under tooth, both salty and savory. Most people would never know it was developed in a lab. Last year, Finless hosted a tasting of its first fish prototype, a cultured carp paste, which a local chef mixed with potato into a croquette. Selden and Wyrwas figured that, if they had produced a pound of this cultured carp, it would have cost $19,000, not including labor. A reporter for the Guardian sampled the croquettes and found them "both delicious and disappointing . . . I just about detect a pleasant aftertaste of the sea, though not fish as such." Flavor profiles are just one obstacle. Fetal bovine serum, or FBS, is an essential ingredient in the culturing process. The serum stimulates cells to divide and grow outside the animal's body. The problem is, as the name implies, FBS is derived from fetuses removed from pregnant cows during slaughter, which, as Tetrick notes, connects "clean" cellular agriculture to a sometimes inhumane system that the start-ups are trying to disavow. Just, Tetrick adds, has developed its own plant-based serum to replace FBS. Selden and Wyrwas with Finless say they're working on their own alternative serum, too, which they plan to have ready in time to launch their first bluefin tuna product — a paste that could be used in sushi rolls and other dishes — by the end of 2019 or beginning of 2020. "Barring major regulatory shake-ups," Selden notes. The small cellular ag community is still waiting to learn what U.S. agency, or agencies, will have oversight of the industry. Both the U.S. Department of Agriculture and the Food and Drug Administration can justifiably lay claim to the task. But Just's Tetrick, for one, isn't waiting around for the government; he's looking toward Asia. If the politicians in America, Tetrick says, can't clear a path to market for cultured meat, other countries will. "And we will be buying our meat for the next 30 years from them," he adds. But even if consumers are hesitant, some meat producers and fish processors are already on board. Cargill and Tyson Foods, two of the largest meat producers in America, have both invested in Memphis Meats, another Bay Area cultured meat company. In an email to The Post, Uma Valeti, co-founder and chief executive of Memphis Meats, said that "we believe that Tyson can help us on our journey to scale up production and bring products to consumers." Henry Ichinose, owner of ABS Seafood in San Francisco, sees the potential of cell-based bluefin tuna. Standing in his warehouse on the famous Fisherman's Wharf, oblivious to the chilly temperatures required to process fish, Ichinose says: "The oceans are already taxed. Nobody really knows how bad it is out there." He thinks the seafood industry needs to embrace change to survive as the planet's population continues to grow and its resources continue to shrink. But will chefs, home cooks and diners accept cell-based fish? "I don't see why not," Ichinose says. "Ultimately, it's cells dividing and growing, just like any other animal or plant."